For an optimal fighting strategy against an opponent you want to quickly evaluate what martial skills they use and prefer and what skills they don’t have. Don’t fight them where they are strong, force them to fight you using skills where they are weak. This is called “controlling the fighting range”. Most martial art systems tend to be limited in the type of skills they train in. Styles tend to specialize in only 1 or 2 ranges of the “4 fighting ranges”. Additionally most schools teach martial ways or martial sports so they teach 2 ranges but they only teach the just the sport aspects of those 2 ranges. For example most kickboxing is a combination of karate kicking (sport) combined with boxing punching (sport). There are a lot of techniques and aspects of kicking and punching they don’t teach because they fall outside the rules of their sport or because they no longer have that original knowledge. Different arts specialize in different things. Kick and punch range: Tae kwon do, the Karate arts (Shotokan, Okinowa te, Wado-ryu, Kyokushinkai, Goju ryu etc), Savate, Kickboxing, Boxing etc. When you are forming an optimal strategy to fight a trained (or untrained) opponent you want to force them to come out of the fighting range they are skilled in and make them fight in a range they don’t know well. If you have a sport karate or tae kwon do trained opponent force them into infighting or grappling range where their arts have no skills. Make the grappler fight in kick range and defend against long range striking. Or if you have to fight in their chosen range use combat aspects of that range that their sport training is unable to defend well. 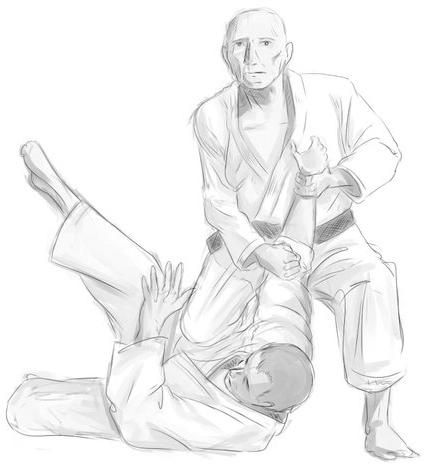 If you’re grappling a wrestler using choking techniques is very effective because they are not trained in chokes or choke defenses. Many sport tae kwon do fighters are not used to using or defending against kicks to the legs (because low line kicks are against the rules of their sport) so they are vulnerable to leg attacks. Control the fighting range, combine that with the physical matchup and other concepts and you gain the advantage in the fight. If you would like the chance to come and train at our school for 2 Weeks. or Click Here to reserve yourself a space. We will contact you with Info & Availability.